DSCN7045, originally uploaded by Prince of Petworth. I’m writing about something I’ve seen mentioned a couple of times on your site, with some discussion/debate, but which is very close to my heart. This morning, I stopped by Alice Swanson’s ghost bike. I was placing some flowers in the basket and debating whether to clean out some of the older flowers left there, when a gentleman came up and asked me if I was a friend of Alice’s. I said I was, and he said that he lived in the area and biked by every day, and appreciated seeing the bike every day. I know that not all of your readers and commenters feel the same way, and I don’t know what the future plans are for Alice’s bike. I do know that I try to tend to it whenever I am nearby, and I know that countless others– those who knew Alice and many who didn’t– also keep it looking nice, and often decorate it for holidays and such. If this is a distraction to riders or an eyesore to some, I’m sorry– that is certainly not the intention. 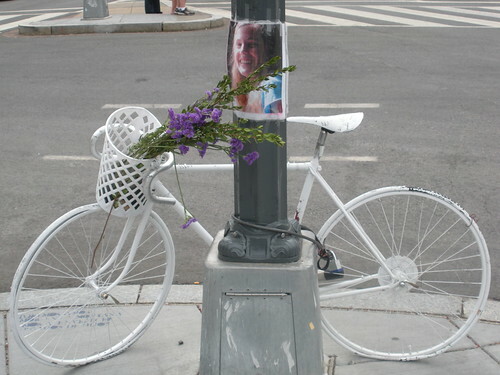 For many of us, it is a place to remember Alice and to have an outward expression of our feelings at her loss and also at her life, and the ghost bike itself stands as a reminder of caution.